It’s not uncommon to hear horns honking or angry voices shouting at other drivers while out on the road. A recent study conducted by the AAA Foundation for Traffic Safety found that these and other aggressive driving behaviors are highly common, a troubling fact given their link to other unsafe driving behavior and serious auto accidents. The study consisted of a survey taken of over 2,700 drivers across the country regarding their driving habits and behaviors while behind the wheel. The survey explored whether the participants were aggressive drivers by asking whether they engaged in aggressive behaviors such as yelling at other drivers, tailgating (defined here as following another driver closely in order to get them to move or accelerate), preventing a driver from changing lanes, honking at another driver in anger, angrily gesturing at another driver, cutting off a driver deliberately, physically confronting another driver, or hitting or tapping another car on purpose. Seventy-eight percent of those surveyed admitted to committing at least one of the behaviors over the past year. The most common was tailgating, with 51% of participants admitting to the behavior. 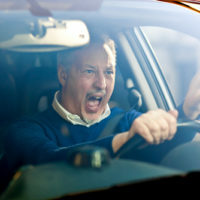 Yelling at other drivers and honking out of anger were also commonly reported. Though less common, a troublingly high percentage of drivers admitted to physically confronting other drivers when disagreements on the road became heated, with 4% of survey participants admitting to this behavior. Twelve percent of drivers cut off another driver deliberately, and 3% admitted to bumping or ramming another car on purpose. When extrapolated out to the whole population of drivers in the US, this means that an estimated 5.7 million American drivers hit another car on purpose at some point during the past year. It is also important to keep in mind that this survey tracked only the participants’ self-reported aggressive behaviors. The AAA Foundation researchers stated that, since aggressive driving is an undesirable trait, participants are likely to underreport how often they engage in such behaviors. While aggressive driving is undesirable in and of itself, the behavior has additional safety implications. In a past study conducted by the AAA Foundation, researchers found that nearly 56% of all accidents involving a fatality were preceded by at least one act of aggressive driving behavior. Researchers posit that more rigorous enforcement of existing laws barring aggressive driving behaviors, such as following too closely or passing at too close a distance, could help to stem these behaviors and even reduce fatal accidents. If you have been hurt in an accident with a negligent, reckless, or aggressive driver in Idaho, contact the knowledgeable and trial-ready personal injury lawyers at Pedersen & Whitehead for a consultation at 208-734-2552 in Twin Falls or 208-336-2552 in Boise.